Mornings can make or break a day. After I started implementing my morning routine, I really saw the difference in my productivity and attitude. Breakfast is a part of the routine, but I can always feel the difference when I have lots of fruits and veggies for breakfast and when I have lots of carbs. So, I am making a conscious effort to get in more vitamins in the mornings! Smoothies are such a great way to do this, but sometimes I want to sit down and feel like I am actually eating a meal instead of drinking one. 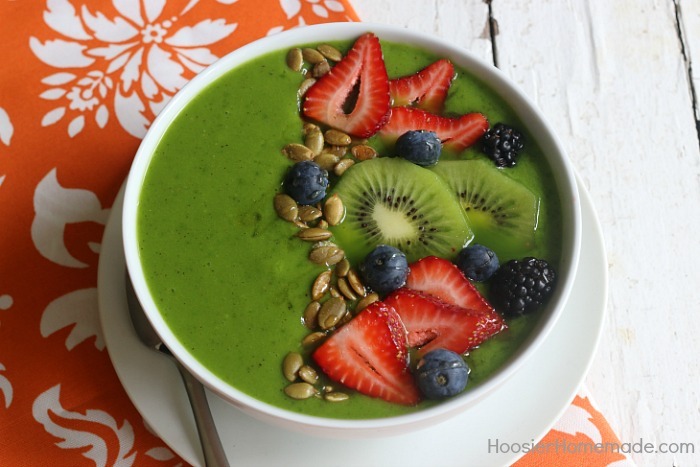 Enter the healthy tropical smoothie bowl! 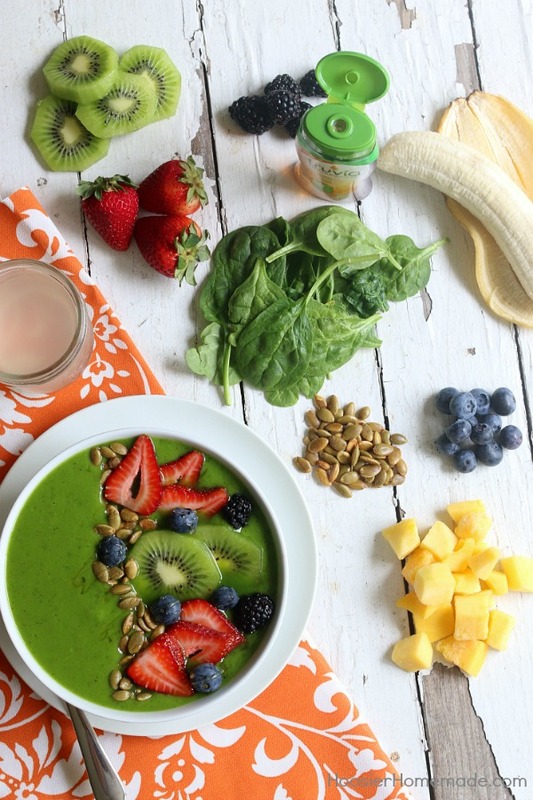 My tropical healthy smoothie bowl is so good- the smoothie is packed full of flavor and toppings give it a little crunch. I love that each bite has something a little different- and the texture is so good! I am not a big lover of vegetables, unfortunately, so knowing that right off the bat I have a serving of greens in makes me feel better. 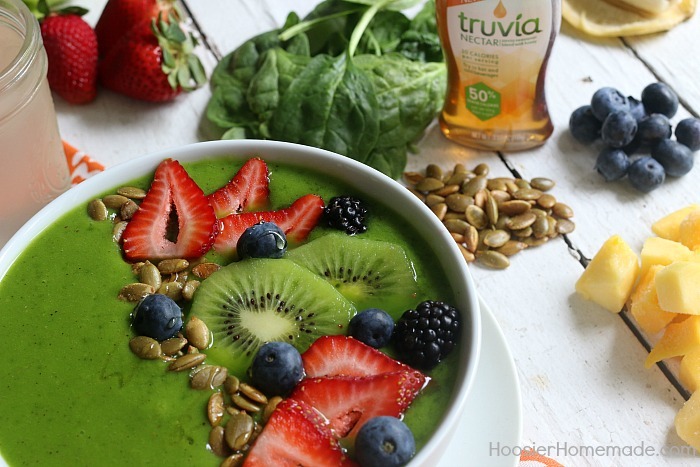 To add a little extra sweetness, I used Truvia’s new product, Truvia Nectar. I love to use honey or agave in my smoothies, but don’t love the extra calories. Truvia Nectar is honey blended with stevia leaf extract, and has 50% fewer calories per serving than sugar. Plus it is twice as sweet as honey, so you only need a little bit! I can’t wait to try it in coffee too! To make the smoothie I blended all of the ingredients- making sure there were no clumps! I blend the spinach and coconut water first, and then add in the fruit once that is smooth- I feel like there aren’t clumps of spinach that way! This is one of my favorite recipes for a smoothie- and one I will definitely grab and go on a hectic morning! Then it is time to add the toppings! You can really add any fresh fruits and seeds you would like, but I love this combination! And the kiwi makes me feel like I am on vacation! 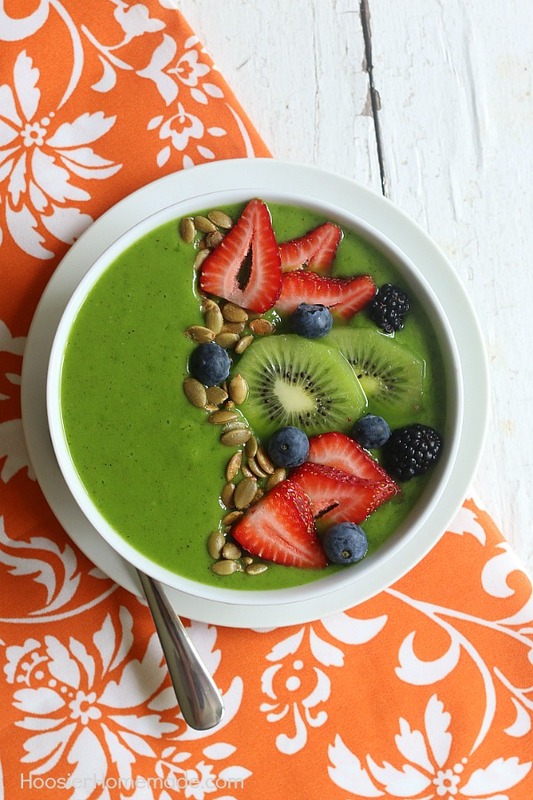 This smoothie bowl is a game changer. Lots of fruits and veggies but served in a way that I can sit down and chat with Doug over breakfast. It keeps me full, keeps me feeling good, and keeps me coming back for more! 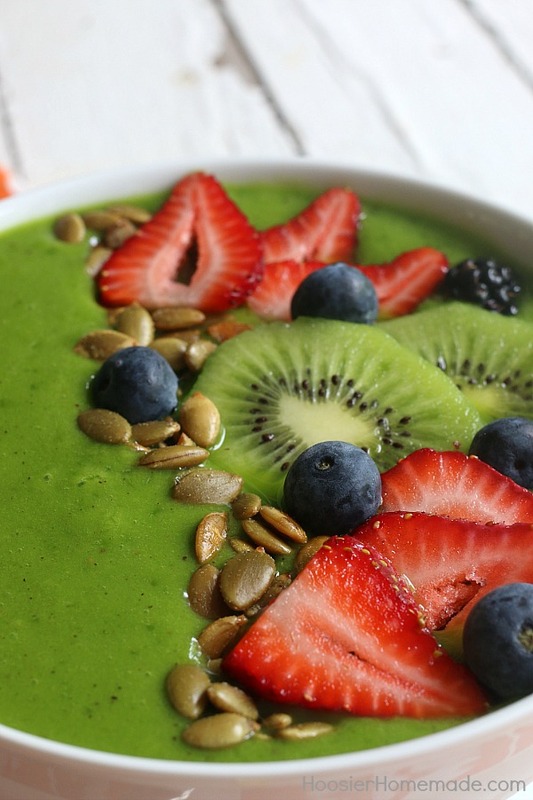 Packed full of flavor and goodness, this Tropical Smoothie Bowl will start your morning off right! Whip up the smoothie in seconds and then add delicious ingredients to the top for a one of a kind breakfast!